I am all about a recipe that looks really hard to accomplish but is actually REALLY easy to make. That is EXACTLY what these American Flag Rice Krispie treats are... They are SO easy to make but are always the biggest hit at every 4th of July party. Make two batches of Rice Krispie Treats. I leave one white and I use food coloring to dye the second with red food coloring. 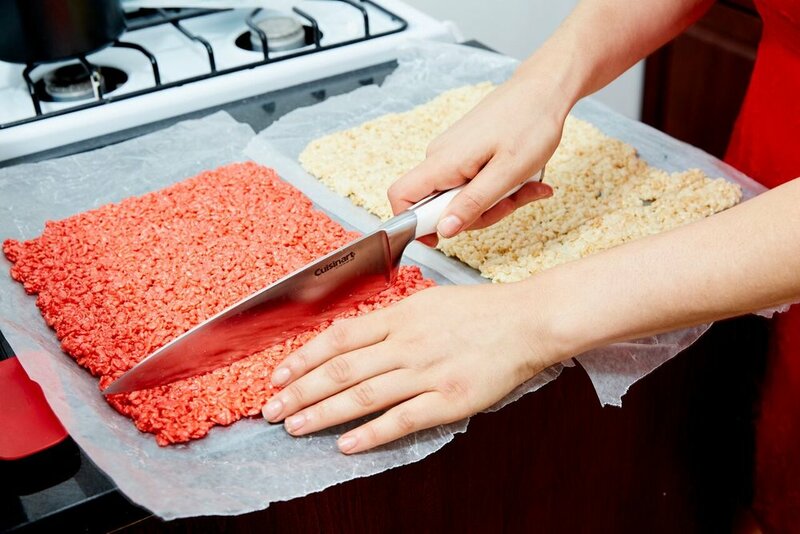 Once mixed, press the Rice Krispie Treat mixture into two cookie sheets in a THIN layer. I cut the sheet of Rice Krispie Treats into three equal pieces. Each of these will be a stripe in the flag. You will do the same thing with the sheet of white Rice Krispie Treats! For the remaining 1/3 of the sheet of red and white sheets of Rice Krispie Treats, cut them in half. These half pieces go next to the blue part of the flag! Make a smaller batch of blue Rice Krispie Treats. Once the blue is ready, take ALL three and start stacking using the strips you cut. The longer red and white go one on top of the other until you have 2 reds and 2 whites. Then you stack the 1/2 cut reds and whites and stacks those on the right side of the stack. On the left side, you stack the blue! Here comes the fun part! Once you have it all stacked, you take a sharp knife and cut the block of stacked krispies into a flag!!! Can you believe that's all it takes?! 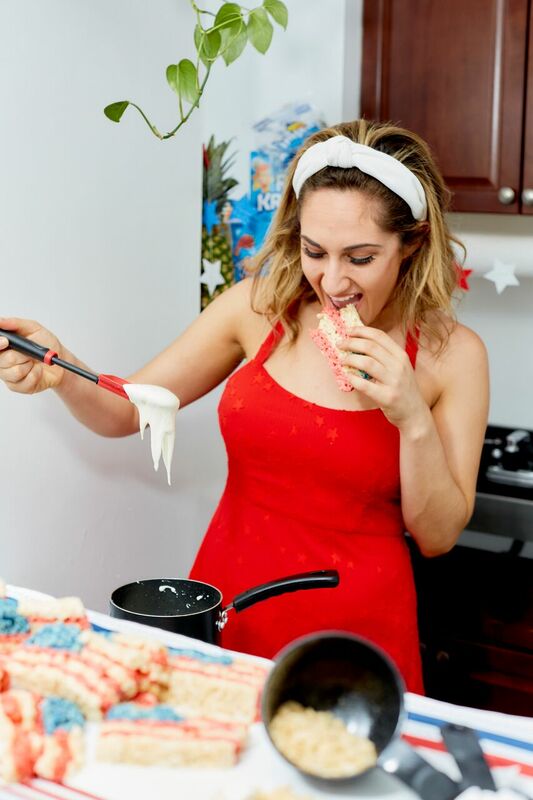 Super easy and ends up making the cutest Fourth Of July Dessert... EVER?! Included some links below, like my headband and my red star dress! !